X-Factor 2013: Live show 3 and it's movie night! Another week rolls by and having said farewell to two of Sharon Osborne’s contestants things are not looking good for the Over 25’s – in fact let’s just call the category Sam Bailey. This week was movie night – a theme that gets rolled out of the X-Factor theme cupboard every year it seems. Rough copy opened the show and having chosen Robin Hood: Prince of Thieves as their movie they could only sing the classic “Everything I do”. Sam Callahan sang “All I want is you” from the movie Juno but will likely rely on his pretty boy image to keep in the competition. Hannah Barrett, fond of crying belted out "Skyfall" from James Bond. She is likely to be one of the slow burners of this year’s competition and before we know it will be in the semi-final vying for a place in the final. Nicolas McDonald gave us In the “Arms of an Angel” from the movie City of Angels and not an older woman in sight but Sharon did say he looked “like a big boy tonight” after his performance. Abi Alton didn’t have a good week last week and if she was hoping for a better one this week then she was sorely disappointed having sung Breakfast at Tiffany’s "Moon River" the judges were harsh and it all ended in tears on stage. Miss Dynamix managed to make it on stage this week having missed last week’s show due to SeSe’s illness which was allegedly a panic attack and nothing to do with being pregnant. They sang Gabrielle’s "Dreams" from the movie Magnolia. The unstoppable Sam Bailey was up next singing “My heart will go” on from Titanic - she got a great reaction for the audience. Kingsland Road who were in the bottom two last week had to up their game this week and sung "Pretty Woman" from well Pretty Woman! Not a song expected from the five piece but they seemed to hold it together and give a good enough performance. Luke Friend (and his hair – which seems to have its own fan club) was up next and stripped it right down with just him and a guitar singing "Kiss from a Rose". Last but certainly not least was Tamera Foster and she was singing "Listen" from Dream Girls. She belted it out but surprisingly was criticised for being more of a Beyoncé impersonator. Cue Flash vote and ten minutes later we were waiting to see who take part in the sing off. Category by category we saw the girls, followed by the Over 25’s (Sam Bailey) and finally the boys make it through to Sunday night. 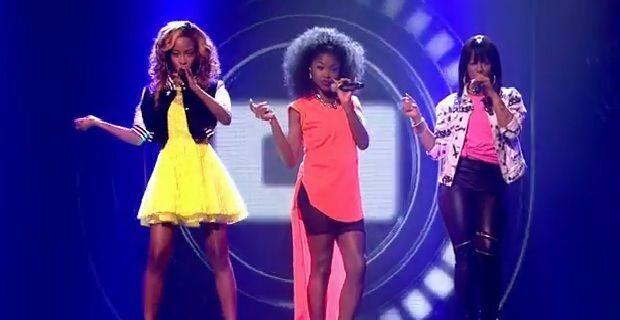 A group was bottom of the pack and this week it was Miss Dynamix – unsurprising having not performed last week. The usual Sunday night included celebrity guests in the form of The Wanted who were followed by the larger than life Lady Gaga who gave a somewhat bizarre performance then roll on sing off. But first we needed to know who would be joining Miss Dynamix who “won” the Flash vote. And it was shockingly Hannah Barrett. Up first was Hannah Barrett performing Emeli Sande’s Read all about it and Miss Dynamix performed Swedish House Mafia’s Don’t You Worry Child – probably their best performance to date but it was too little too late and they were voted off as the third act to leave the series. Tune in to the next X-Factor live show next Saturday night ITV1 at 8pm for Disco night with the results show 8pm on Sunday.